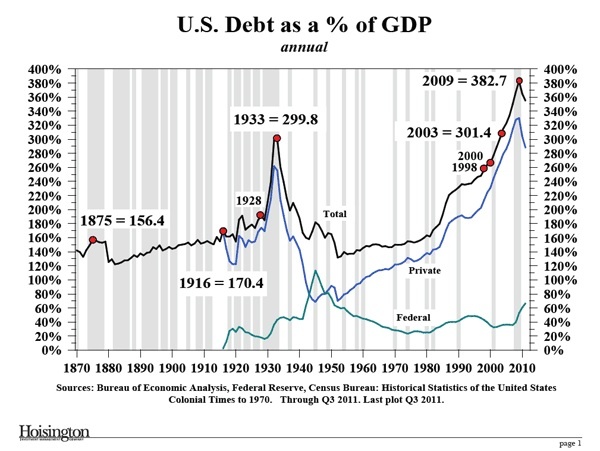 Below is the total debt of the US since 1870 as a share of Gross Domestic Product (GDP), compiled by Dr. Hunt. Hunt argues that in order to understand where we are in the great cycles of the economy, you have to go back very far in the past. This analysis is based on the “Debt Supercycle” theory that credit bubbles are what cause Depressions – and that there have been roughly five in US history. You can see the Panic of 1873 as a small blip on the far end, with the Great Depression of 1929 as the big spike to the middle. The mountain of debt, 382% of GDP, is where we are today. This long view clearly shows the cycles of debt. Total debt creeps up as investments are made in a strong economy. When things have been humming along for a while there’s no reason to believe they won’t keep on keepin’ on. Businesses borrow more, states build infrastructure, consumers use their credit cards, and banks don’t really worry about the risk because hardly anyone defaults. Then, when it reaches a certain level, the economy falls back to a point where it simply can’t service that debt any longer. The Depressions are clearly marked as spikes of debt taken on to keep the good times rollin’ when, in fact, it was all about to stop. There are many features worth commenting on, but several stand out. Federal (and State) debt is less significant than the overall debt taken on by the economy. We also have a much more serious problem with debt than ever before. Note that recently there is a definite inflection point about 1980, the year we keep going back to as the start of the recent trouble. That’s when consumer credit takes off as a driving force. Note also the final ascent to the top of the mountain that kicks in about 2000, when today’s Managed Depression began. That is when total debt as a share of GDP roughly equaled the 1929 Great Depression peak. The policies that got us here assumed the official “Recession” of 2001 was a typical Postwar event. Low interest rates and a large Federal deficit were expected to “prime the pump” and get us all moving again. While the worst effects of a depression were managed well, the main effect was to prolong the pain and make it harder for our political system to focus on the real issue that got us to this point – the large cycles of debt through our history. This is the main “Fisherian” argument that long economic cycles can be described as “Debt Supercycles”. Our political spectrum, or what we argue over, is usually defined by very different economic beliefs. The left tends to look to “demand management”put forth by Keynes, stating that depressions come from a lack of demand. The right usually argues for “supply side” expansions of investment capital to get through downturns, as argued by Friedman. The Bush administration did a lot of both getting us through the first phase of the Managed Depression. How will this all end? There is little doubt that there will be default. This is why economists like Hyman Minsky argued that banks have to be kept small – so that no one is ever “Too Big to Fail” and default can occur naturally before a big credit bubble developed. It’s a bit late for that, but it will have to come. The long view shows not only the Debt Supercycles, but our place in history. It is not unique, but it is unusual. We have some idea what will happen next because it has happened before – but it is not pretty. Then again, once we get out of this phase of the cycle there will be good times ahead – and the sooner we learn to deal with this crushing debt the sooner they will come. This entry was posted in Money and tagged debt, Economics, economy. Bookmark the permalink.